Dentex trout (Salmo dentex) known as "zubatak" among the local people is one of the last salmonids, whose existence is still unclear. The fish was first described in the rivers Krka, Cetina and Neretva by Heckel already in 1852 and confirmed in the Krka by Gridelli (1936). Nowadays, this fish is reported to inhabit lower part of the river Neretva, Hutovo blato (Glamuzina, 2004), the river Cetina (Mrakovčić, 1995), the Morača river basin in Montenegro (Mrdak et al., 2006), and possibly also the Aoos stream in Greece (Delling, 2003). The fish is by its external appearance somewhat similar to brown trout, softmouth trout and marble trout, all native to the dentex trout distribution range with the exception of the Aoos stream. That's why this fish has been sometimes considered a hybrid between these three groups. 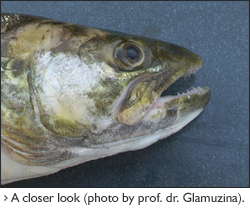 However, recent morphological analysis performed on museum specimen originating from the Neretva indicates that this fish might represent an independent trout lineage. Altough the preliminary genetic data suggested the same, the recently performed genetic tests that included an extended molecular marker set and several samples of marmorated trout from the Neretva river, indicated that dentex trout was genetically indistinct from Neretva marmorated trout (for details, see summary of our last findings). 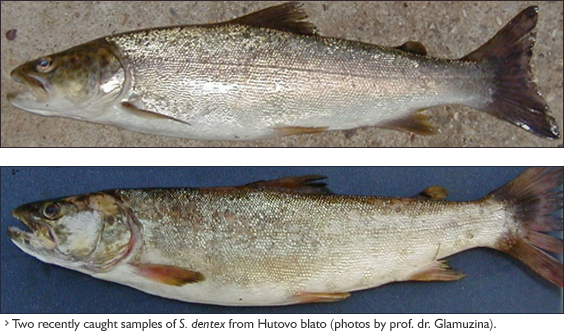 Dentex trout has been poorly studied due to lack of samples for detailed analyses, hybridisation and diverse and multiple designation of the same trout in different areas of the region (e.g., in the upper Neretva, zubatak is a common name for brown trout, and glavatica for marmorated trout; in the lower part, some people call marmorated trout zubatak while S. dentex is known as zubara; others call S. dentex zubatak, which is in congruence with Heckel's classification, and zubara is considered a "species" that has not yet been described!!!). On our way back from the Ichthyological congress in Cavtat, we stopped for a while at the lower part of the Neretva river (near Čapljina) to join sampling in the wetland of Hutovo blato, performed by our colleagues B. Glamuzina and P. Tutman from Universities of Dubrovnik and Split. Hutovo blato wetlands are situated in North West of the Neretva river estuary in southern part of Bosnia-Herzegovina. Mediterranean wetland would normally be considered highly productive, shallow warm water area with a high degree of biodiversity. This definition doesn't match Hutovo blato wetlands which have several shallow lakes and channels filled with clear and cold water (around 13° C whole year) creating unique living conditions suitable also for salmonids. 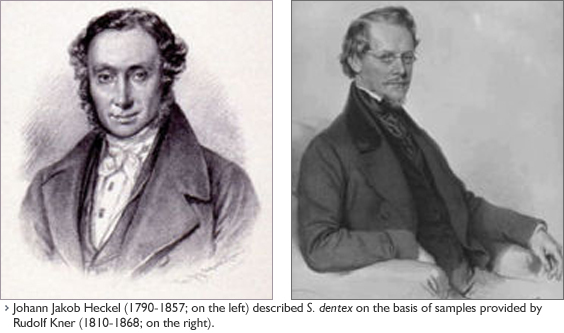 And indeed, S. dentex is known to inhabit this area. Due to unusually low water of Hutovo blato, which is a consequence of extremely dry and hot weather this year, we were not able to access locations in Hutovo blato, where dentex trout is expected to be found. Nevertheless, after returning back to our "headquarters", our Croat colleagues told us about results they obtained in 2001, when they performed a comprehensive ichthyological survey on Hutovo blato: All caught dentex trout specimens were above 20 cm in length, which suggest that they migrate to Hutovo blato in their advanced life stage. According to survey and talks with sport fishermen in the area, the spawning grounds of dentex trout are in deep and fast water flow in the rocky canyon of the Neretva River close to Mostar. These grounds are 40 km from Hutovo blato wetlands, and based on these findings it could be predicted that dentex trout lives in Neretva River during juvenile period, and then started to enter nursery grounds, such as Hutovo blato wetlands. This was completely new information for us suggesting that dentex trout somewhat live in allopatry to other Neretva salmonids occupying highly distinct ecological niche. If this is really the case, such a distinct pattern of life history and distribution may be crucial driving force for evolution of new Salmo taxon. Delling, B., 2003. Doctoral dissertation. Department of zoology, Stockholm University, Sweden. Glamuzina, B., Bartulović, V., 2006. Ribarstvo, 64 (2): 59-64. Heckel, J., 1852. Sitzungsberichte der Mathematisch-Naturwissenschaftlichen Classe der kaiserlichen Akademie der Wissenschaften 8, 347-390. Mrakovčić, M., Mišetić, S., Povž, M., 1995. Biological Conservation, 72: 179–185. Mrdak, D., Simonović, P., Sušnik, S., Snoj, A., 2006. II International Symposium of Ecologists of Montenegro – Proceedings of the Symposium: 137-142.